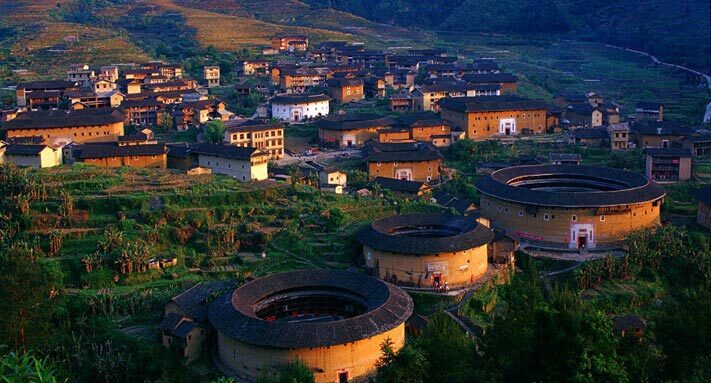 There are a group of active tour guides that tirelessly illustrate what they know about the earth buildings and affect the tourists with their words in the world cultural heritage Yongding earth buildings, making them a part of the earth building. "We have 186 commentators, and 90% of them are local residents," said You Hai-bo, general manager of Fujian Kakkas Earth Building Tourism & Development Co,. Ltd. "They love the land they stand and illustrate the earth buildings to every tourist with their deep emotion." With Kakkas style bamboo hat and Kakkas mandarin, 35-year-old Jiang Yun-zhao has illustrated to the tourists for 4 years in the Hongkeng Kakkas cultural earth building county, hence, the fame of "Prince Earth Building." "I serve 6 to 7 groups of tourists during the peak period and work the whole day in the golden week. Of course it is tired, but I am very happy and pride to introduce my home to the tourists all over the world. And I love my job," he said.